As you look around your work space, do you see funny quotes, pictures of your family members or pet, plants, memorabilia from a vacation or even your favorite coffee mug or drawing from your kid? 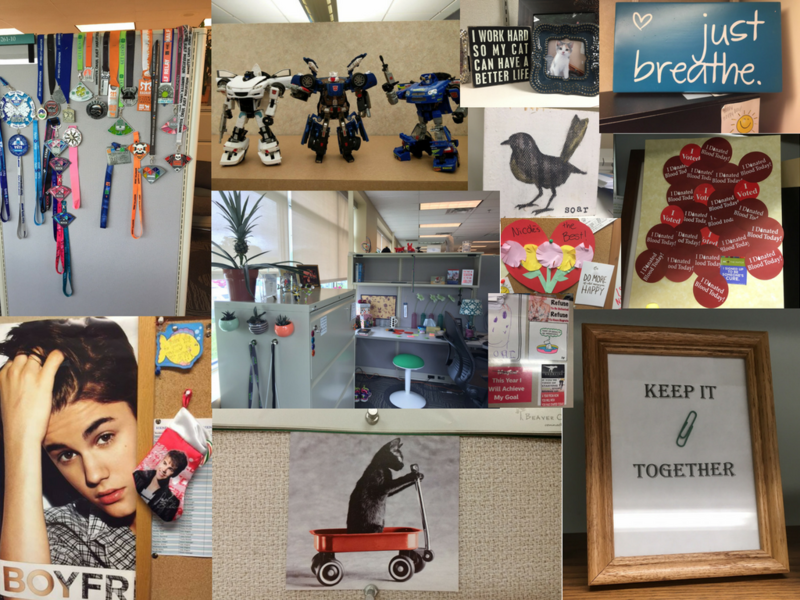 These are items that many of us display in our office space because it makes us relax, laugh or reflect on sweet memories. It makes our space "ours" and can really offer a more cozy environment in which to work. These comforting and uplifting effects of our work spaces on our perspectives are positively contributing to our health in an emotional way. Therefore, we asked some of you to send us your work space pictures in an effort to encourage each other to make our work environments fun, inspiring and positive. Let's see some examples from our colleagues! Isn't it fun to see all the different items people have in their office area?! Personalize: make your area a reflection of your unique personality...witty, quirky, nerdy, glamorous, animal lover, etc. Whatever it is, let it reflect who you are. Keep it clean: it's always easier to find papers and concentrate more clearly when you keep your work space physically clean and organized, but also make sure it remains Mayo appropriate...we know some quotes or other items would be funny but they may not be the most appropriate in a work environment. Get Creative: incorporate your own artwork or crafts or maybe that of your kids'. The possibilities are endless. Think green: consider adding some flora and fauna to your area. Having a couple plants and/or flowers really brightens up a work space and provides a feeling of the outdoors inside. Just don't forget to water them! Make it inviting: add some funk and flare to your area that will be inviting for others and perhaps act as a fun conversation starter. Whether it be an item or picture from a vacation, a medal or ribbon from a competition, a movie quote or a bowl of chocolates to share, these can foster an engaging environment with colleagues. Now, it's time to look around your work area and create a positive environment that reflects your unique personality! It's amazing the impact that these small things can have on our mindset when we take the time to pause in the midst of our busy schedules.